Riverhold was part of the Cyrodilic Empire by 1E 2920, in which year the city was ruled by Queen Naghea who fought at the Battle of Bodrum during the Four-Score War. Riverhold gained its independence after the collapse of the Cyrodilic Empire in 2E 430. After the outbreak of the Knahaten Flu at Senchal in 2E 560, Rathuni-la Dawnwhisker, a Daughter of Azurah from Riverhold, helped combat the disease with the development of a sorghum-tea that mitigated its symptoms. The Legion of the West Weald, led by General Lavinia Axius, subsequently conquered and annexed Riverhold and Orcrest for the Empire of Cyrodiil, and a Khajiiti campaign to retake the city was repelled in c. 2E 562. The city was later retaken by the Elsweyr Confederacy, but Riverhold was reconquered by the Cyrodilic Empire by 2E 896. During the Imperial Simulacrum, the city was ruled by King Ab'dul and rivalled Orcrest and Dune. 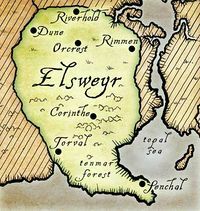 Riverhold remained part of the Empire of Tamriel until the coup of 4E 115, after which the city became part of the Kingdom of Anequina, a client state of the Third Aldmeri Dominion.